Film history needed a Magnificent Ambersons. There had to be that one “lost” great film for which we could collectively weep, but whose brilliance remains undulled. The notorious mistreatment of Orson Welles’s Citizen Kane follow-up by nervous RKO execs speaks to the inherent duality of cinema as art and commerce, and provides the ultimate evidence of an auteur cut off at the knees by studio heads thinking only of the bottom line. But it also proves, better perhaps than any American film ever made, that the personality and grandeur of a true visionary cannot be deleted, even if diluted. The Magnificent Ambersons’ imperfections are perhaps more revealing than Citizen Kane’s improbable perfections, saying more about the nature of the beast that is Hollywood filmmaking than that sui generis debut. Welles caused a stir with Kane in 1941, and even shared a screenwriting Oscar with Herman Mankiewicz for his troubles, despite underwhelming box office. Yet the making of 1942’s The Magnificent Ambersons proved he had not been, and never would be, handed the keys to the kingdom. If anything, Ambersons was an even more ambitious production than Kane, a radically dark, character-driven narrative that functions as a downward spiral, following characters not to any moral epiphany but to the revelation that they’re irrelevant. Mixed test screenings (response card samples: “The worst picture I saw”; “People like to laff, not be bored to death”; “A horrible distorted dream”; “I think it was the best picture I have ever seen”) made the powers that be nervous—so nervous, in fact, that, during the film’s postproduction, with Welles largely incommunicado down in Rio, preparing for It’s All True, an ultimately unfinished documentary he was enlisted to make as part of the U.S. government’s wartime Good Neighbor Policy, RKO went ahead and made an alarming number of unauthorized cuts. With the help of some of Welles’s crew (including editor Robert Wise), they also rearranged the order of a handful of sequences and reshot key scenes, including the ending. “There’d been no preview of Kane. Think what would have happened to Kane if there had been one!” Orson Welles told Peter Bogdanovich decades later. We can’t entertain the thought, Orson. The last seventy years of filmmaking sure would have looked a lot different. Detailed descriptions of the injustices that befell Ambersons are available elsewhere, as are photographs from cut scenes—all helpful for mental reconstructions of the movie that might have been. Yet focusing predominantly on these matters only serves to further take power away from Welles himself. As an auteurist film culture, we naturally want to see films as their filmmakers envisioned them; reading Bogdanovich’s reports of Welles tearing up and having to leave the room when he happens upon Ambersons on television could encourage us to do the same. But for all its talk as a lost film, it’s anything but a lost cause: the most astonishing thing about The Magnificent Ambersons is not what was done to it, but that, despite all the tinkering and toying, it remains one of Hollywood’s supreme accomplishments, not just technically audacious or narratively challenging, but a successful realization of Welles’s vision and an overwhelming experience, both emotionally and atmospherically. And perhaps more than any other American film, it both embraces and questions nostalgia, fashioning itself as a memento of a time gone by—in this sense its status as a lost film is wholly, devastatingly appropriate. It’s also a remarkably faithful adaptation of Booth Tarkington’s 1918 novel; such fidelity was a rarity in this era of Hollywood, when best-sellers were often snatched up and slaughtered by studio scribes being held on a tight leash (even the most laudable page-to-screen transitions—think The Grapes of Wrath, Rebecca, and Mildred Pierce—tended to pick and choose elements from their source material). Yet Welles’s screenplay followed Tarkington’s tale to the letter (until the end). And much of what was cut from his film is there in the book for all to read—unsurprisingly the “incidental” stuff included not to push plot forward but to concretize the central themes, mainly the questioning of what is gained and what is lost in American progress. The extant Magnificent Ambersons remains a rich evocation of these matters—as played out in the echoey interactions between the members of the withering titular clan—even if subplots hammering them home (antihero George Amberson Minafer’s ultimately pointless usurping of power at his men’s club; Major Amberson’s decision to erect cheap, profitable boarding houses on their grand property; the carelessness with which the family treats the deed to their mansion) have been excised or relegated to an off-screen line or two. What Welles created is so powerful, and feels so aesthetically complete, that one wonders if without knowledge of its behind-the-scenes mistreatment we would find evidence of its being troubled at all (final shot excepted). One often points to the rushed quality of the film as confirmation of its tampering, especially in its second half, as according to Welles himself, the first six reels were largely structured and edited as he intended (aside from some upsetting trims). Yet a viewer coming to Ambersons for an initial viewing might not see things quite so cut-and-dried: it’s a headlong rush right from the breathtaking start, and proceeds to move at an astonishing clip, befitting a film about progress and those left in its dust. “In those days, they had time for everything,” intones omniscient narrator Welles at the beginning, his voice that fabled combination of honeyed theatricality and distanced acidity. Only in this brief introductory passage will there seemingly be time for anything. In this visionary prologue (which speaks of the general, but shows us the specific, introducing major characters and situations while placing them in a historical continuum), late nineteenth-century American living, with its cotillions and midnight serenades, is looked back upon with warmth, but also foreboding. The picture it paints of its unnamed Midwestern America is just too rosy, the narration a mite caustic; as he’s claimed in interviews, Welles longs for the past, idealizes it all out of proportion, but he also knows well enough to mock his own nostalgia and conservative streak. The fleetness with which he covers a number of decades—measured in images depicting such trivial matters as the variable lengths of men’s waistcoats and the fluctuating tightness of their trousers—indicates the past is something to quickly get over. It also sets the voice of the film in opposition to the family at its center, and specifically its maddening protagonist, Amberson heir George (Tim Holt), resolutely stuck in the past. With George at the wheel, the Ambersons are set on a slow path to uselessness. There’s a literal haze around the edges of the frame during the film’s introductory sequences, which serves to set the film in a murky then, but also encroaches upon and disturbs the overall image. Prepubescent George gallivants around town, while indignant neighbors look on and wish for his “comeuppance,” establishing our main character as a hellion, and not a particularly likeable one; when we first meet grownup George, at a ball thrown at the Amberson mansion, his stiff posture and apathetic mug evincing a distinct discomfort in his own skin, things aren’t markedly better. Though he attends college, he has no interest in studying anything practical, preferring instead to become a “yachtsman”; this charms neither us nor, clearly, Lucy Morgan (Anne Baxter), the fetching daughter of local automobile inventor Eugene Morgan (Joseph Cotten), a stranger whom he rudely dubs a “queer-looking duck.” Tarkington’s emblem of industry and progress, Morgan puts the fall of the Ambersons into sharp relief, as he rises from quirky horseless carriage conductor to nouveau riche magnate. Complicating matters is his undying love for George’s mother, Isabel (Dolores Costello), who would have been his wife had George’s father, milquetoast suitor Wilbur Minafer, not intercepted her. In this expansive and gloriously choreographed ball sequence, we also are introduced to three more Ambersons, filling out all the major parts: dissatisfied spinster and gossip hound Aunt Fanny (Agnes Moorehead), bemused congressman Uncle Jack (Ray Collins), and fading patriarch, George’s grandfather Major Amberson (Richard Bennett). Though this ball sequence was in later years mourned by Welles due to the errant snips that broke up what the director considered possibly his greatest single-take achievement, which allegedly ran for an entire reel (its bowdlerization marked by a conspicuous wipe to the main characters around a punchbowl), the athleticism and intricacy of the scene remain startling. Welles did not have as harmonious an experience with Ambersons’ cinematographer Stanley Cortez as he had with Kane’s Gregg Toland, but one would never suspect as much given the confidence with which Ambersons wields its visual invention. When the ceaselessly gliding camera finally settles down at the end of the sequence, to catch the guests’ goodbyes at the front door, Cortez and Welles compose an audacious image that ranks with the best examples of Wellesian deep space: Isabel and Eugene are silhouetted in the foreground, Lucy and George in the back, their dialogue overlapping to create a hushed sort of cacophony—two generations, two classes, two pairs of potential lovers, caught in the shadows, on a literal and figurative threshold. It’s this creation of peculiar atmosphere that identifies Welles’s film as a separate, indelible emotional experience from Tarkington’s book. The movie may follow the same narrative trajectory, and indeed often transpose entire passages of the novel’s dialogue wholesale, but thanks to his idiosyncratic cinematic sensibility, the director creates something dreamlike, even nightmarish, from it. Welles’s simultaneous feel for the rhythms of everyday living and his attraction to the grandiose gesture perhaps never found a better outlet than Ambersons, and there’s a definite, unsettling quality to the way he situates these small people in their imposing surroundings. The radical manner in which he visualizes the mansion (designed by Mark-Lee Kirk) and the family’s interactions within it transforms Tarkington’s story into a haunted-house tale rather than just an expression of a dying aristocracy. 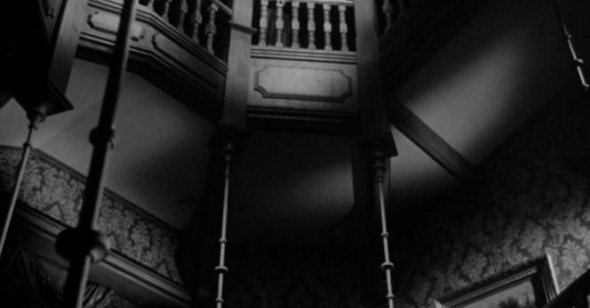 The grandly gothic circular staircase, the site of more than one elaborate crane shot, becomes the family’s rotting core, the locus of their insecurities and paranoia, perfectly expressed in the after-hours sniping between George and Aunt Fanny that happens on its many landings. The entrenched mutual loathing between Holt’s George and Moorehead’s Fanny is one of the glories of American cinema, a thrust and parry between two people who don’t know they’re already ghosts. Lonely and self-consciously dramatic Fanny presumes to be above it all, but enjoys stirring the pot, stealthily fanning the flames of George’s fears, most of them related to Eugene, whom he sees as an unwelcome interloper, as well as a manufacturer of a “useless nuisance”; meanwhile George’s brattiness is ever slowly steeling into monstrousness, fueled by a misguided belief in the family’s importance in the community. Fanny and George seem to self-identify in opposition to one another; each finds the other repulsive—her embarrassing overemotionality, his infantile, rigid selfishness. Yet these two, locked in an epic battle that has clearly gone on for years, are distorted mirror images of one another. Moorehead and Holt are wily, mocking; each of their scenes together is a pas de deux of resentment. Moorehead miraculously overplays without ever seeming like she’s gone too far, at once appearing to feel every emotion—self-pity, fear, mirthful contemptuousness—to a profound, almost hysterical degree and making a mockery of those same emotions. Holt has been perhaps more historically underappreciated, but Welles was correct in his wild praise for the actor (“one of the most interesting actors that’s ever been in American movies”), who would return to playing cowboys after removing George Minafer’s starched collar; his performance slowly builds to a crescendo of deluded indignation. If far from traditionally loveable, these two are fascinating and relatable in their increasingly pathetic attempts at self-preservation—these are after all the two who inadvertently will bring down the house around them. The dysfunction of the Ambersons is truly disturbing; their joylessness reverberates through their home—many times Welles places them in long shots in which the actors seem inseparable from the statues that dot their parlors and foyer. They are the past. The most discomfiting thing about the film, perhaps, is that Welles is equally ambivalent about the characters who represent the future. Progress may steamroll everything in its path, but Eugene Morgan, embodied by an ever-human, never-better Cotten, gracious and gentlemanly, hardly comes across as an agent of destruction. In fact, Eugene often seems the closest thing Ambersons has to a main character with which to identify. Eugene’s relationship with Isabel—complicated further after Wilbur dies and Eugene more actively pursues courting her as a widow—is depicted as pure and without any motive other than aching, thwarted love. George’s increasingly desperate actions to distance his mother from Eugene only further distances George from us as viewers, and brings Eugene closer. So it comes as something of a shock that Ambersons ultimately mourns not for Eugene’s lost love but for the disappearing world that George has been trying to hold on to. One of Welles’s most ambitious plans was a late sequence made up of shots of downtown Los Angeles, meant to stand in for the industrial expansion in Ambersons’ Midwestern suburb, filmed by Welles himself with nothing more than a handheld camera. Once it was taken away and edited down, all that was left was a melancholy montage of dissolves of telephone poles and electric lines, factories and boarding houses. Accompanying George’s walk through town taken on the eve of his ultimate misfortune and long-awaited “comeuppance,” it remains intensely moving. And in the absence of Welles’s discarded final scene—the only substantial addition to Tarkington’s novel, in which Eugene visits Aunt Fanny, now living in a somber boarding house, both faded versions of their former selves—this climactic moment is perhaps the best expression of the film’s broken heart. The fact that Ambersons remains so magnificent is not only a tribute to Welles’s extraordinary ability to both interpret and reinvent the world through the camera but also a reminder that film is, after all, a collaborative medium. Hard for some to swallow perhaps, knowing as much as we do about the film’s production, but some of the cuts might have been smart, or at least creditable, decisions. To admit it takes away some of the provenance of the auteur. Yet for every ghastly change—the reshot ending, with its desperate aim for transcendent redemption; the chopped-up single take at the cotillion—there is another tampered-with scene that nevertheless plays superbly. These include a late-film Fanny-George bout set in the kitchen, restructured to allow Moorehead to more naturally reach a fever pitch; and most memorably, Major Amberson’s overwhelming exit, featuring his poetically rambling “we came out of the sun” monologue, delivered in close-up with the crackling flames from a fireplace reflecting on his face, made inadvertently haunting by an unauthorized abrupt fade out. The film was intended to end in a long fade-out, reversing the opening fade-in from an extended period of blackness. Instead, we get a note of uplift that, while not exactly false (it’s relatively true to the novel), at least jars. So why doesn’t the closing of the film truly disappoint? Maybe it’s because Welles has created a work of art so cohesive it feels like an indomitable force of nature no one could wrestle away. The Magnificent Ambersons is often remembered for everything that went wrong; yet watching it, just about everything feels right. Only Welles, perhaps, could have been the one to properly mourn, knowing fully what might have been. The rest of us are only left with a masterpiece. The Magnificent Ambersons played May 19, 2012, as part of Reverse Shot's See It Big series at Museum of the Moving Image.